My new, larger, work bench looks great. Totally unfamiliar, my workflow seems stifled because I can't find anything. Where did I put the solder wick, or the flush - to - board wire cutter? On my former, crammed bench where 17+ years of experiments went down, I knew where every tool, part and meter sat: the old habitual — de — ritual thing. Then, too, this big bench should feel like home in short order: c'est toujours la même histoire. To break it in, I built something simple with a SAW (surface acoustic wave) resonator. 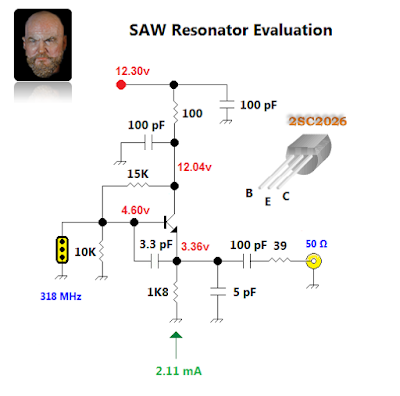 I seek knowledge and only make stuff to learn about hardware AF + RF design and measurement in a fairly narrow scope of practice. Lately, UHF reception work calls: perhaps I'll explore circuits for the ~ 70 cm ISM band with topics like RFID readers and interference measurement? Or maybe enjoy making circuitry for 70 cm amateur satellites, high altitude balloons, GPS and other legal UHF receive activities? Wow, lots to choose from. Yes I could buy a DVB-T dongle, add a LNA, plus an Arduino, or BerryPi micro-controller / system-on-a-chip respectively and be done. Wise choices for some; but what would I learn in scope? 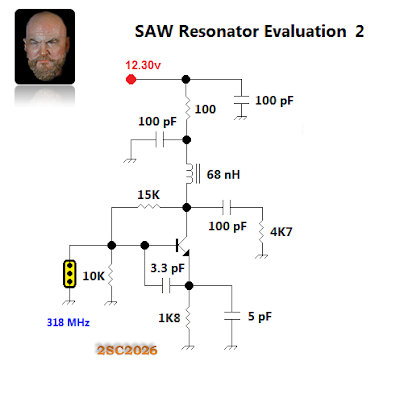 Inspiration to connect up a SAW resonator came from The EMI Finder by Richard, KØDK from his article published in QEX Nov/Dec 2003. (normally downloadable online). Richard built his portable EMI detector leveraging a UHF regenerative receiver integrating both a SAW resonator and filter. 1 day, I'll make a version of his. SAW resonators? Well, in all things radio, I'm about 20-30 years behind. You'll find SAW resonators clocking key-less entry boxes, security systems and garage door openers. Non communications stuff offers much learning for the lay experimenter since abundant, free, high quality literature lies waiting during web searches. Plus it's fun. Since, I'm first exploring lower UHF, I'll be focusing on stuff published in the 1980s to 1990s. 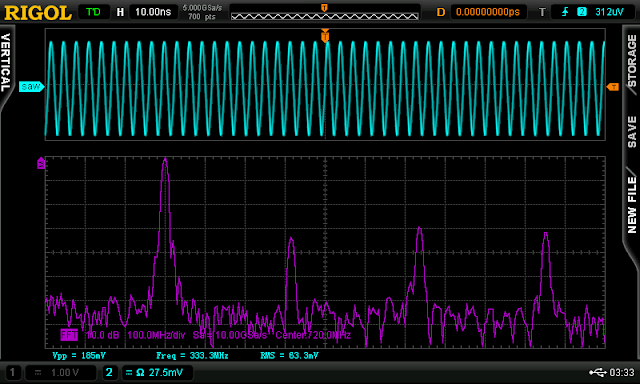 The latest microwave stuff considers a λ of 10 mm – 1 mm! I get 3 IEEE journals and love reading about what the latest engineers envision and measure, although much of it flies above my head. Thankfully, much of the data we often measure/seek is datasheet published: for example, according to the datasheets for the pieces in my SAW resonator collection, Qul ranges for 6 - 10K, and the temperature coefficient of frequency (TCf) runs ± 0.032ppm /°C. 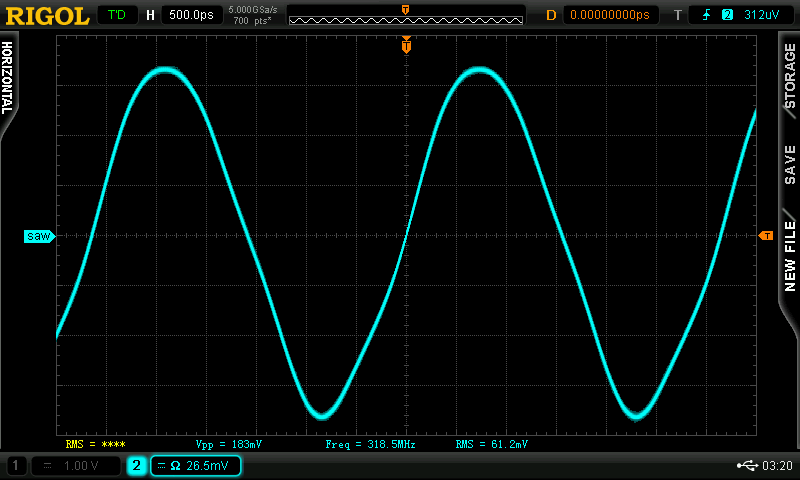 Of course, the negative resistance oscillator amplifier circuitry will also effect temperature drift. Ways to mitigate temperature effects are well documented in the literature. I swept this little 3 pin device between a TG and SA. Above — The S21 sweep looks like what we'd see with a crystal. You'll see a single spur. 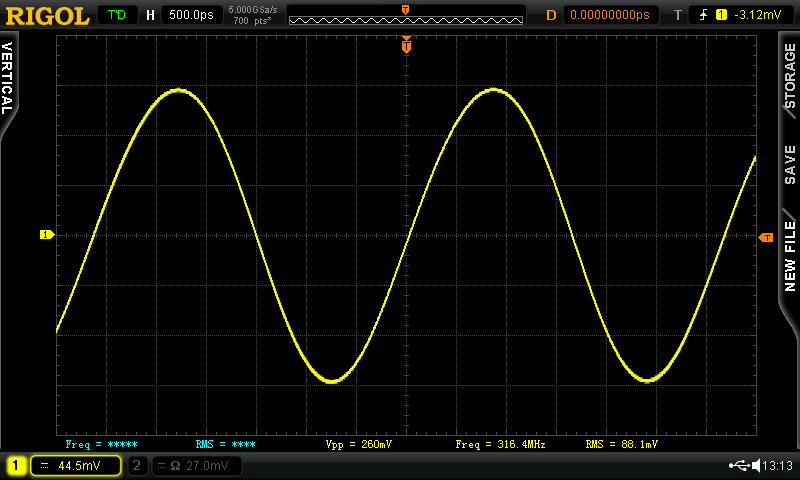 Above — A familiar Colpitts circuit with capacitors scaled to UHF. A few topologies were tried and within reason, the SAW resonator works in some oscillator circuits where we would normally ply a crystal @ HF. 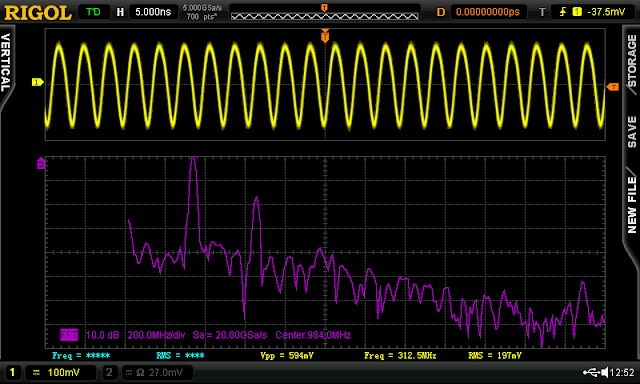 Product datasheets also show ways to easily modulate a SAW-based oscillator, and/or make a low power transmitter. For speed, I hastily built with through - hole parts. 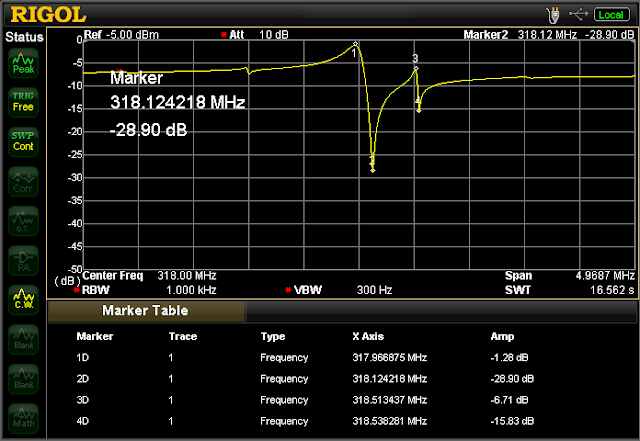 The 2SC2026, a favorite, = a 3 db NF @ 500 MHz BJT with a fT of 2 GHz. 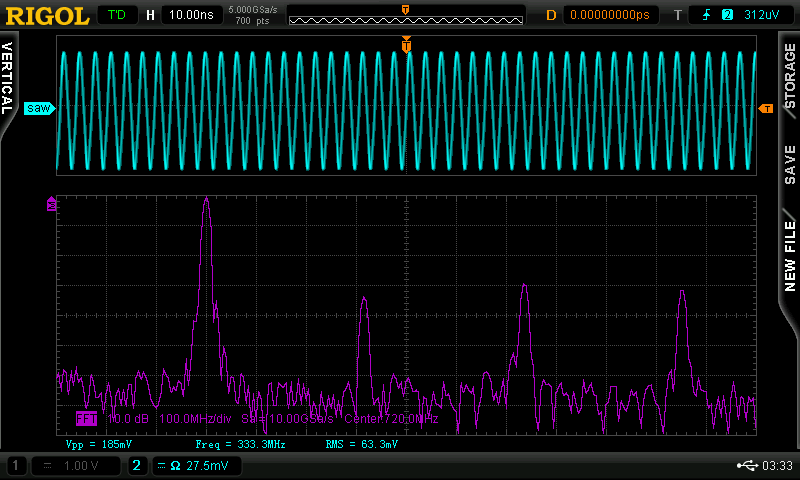 Above — Per usual, the time domain waveform shows distortion when taken from the emitter node of a Colpitts. Above — FFT showing F1 to F4. 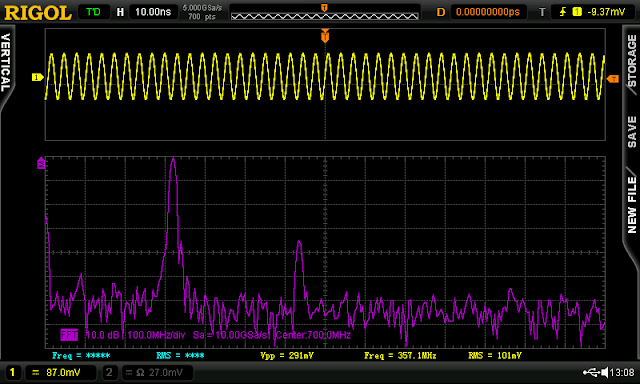 The harmonics help explain why the time domain waveform looks crusty. Above — The original circuit modified by placing a 68 nH, size 0805 chip inductor on the collector. 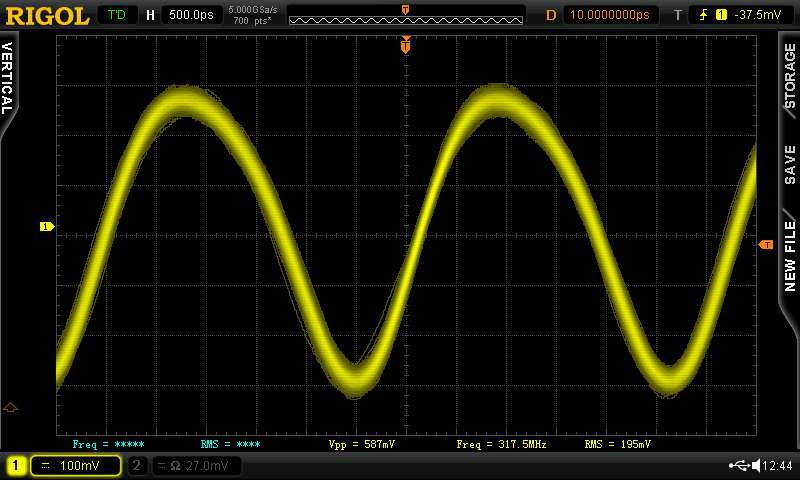 I measured the SRF of this Vishay L @ 1.17 GHz and know the SRF of most every capacitor and formed inductor in my lab. 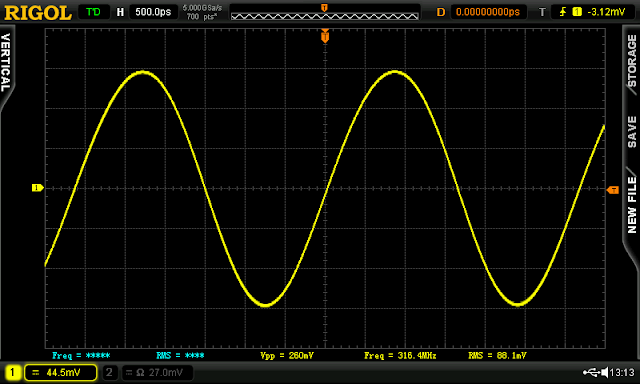 A 4K7 load resistor added for 10 MΩ, 10X probe measurement. 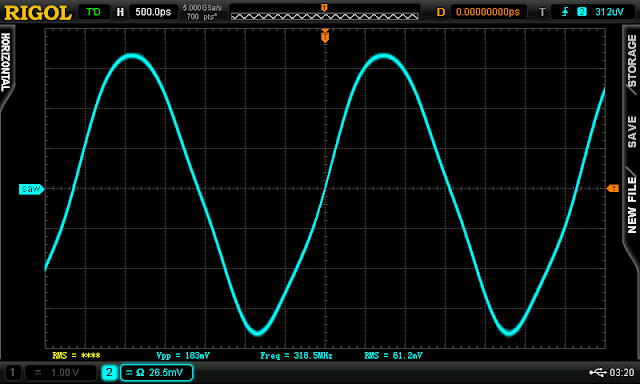 Above — Time domain output showing harmonics. Above — FFT shows the 2nd harmonic @ -17 dBc. Above — I moved the feedback capacitor to the collector as shown in many SAW resonator datasheets. Above — Less distortion seen by eyeballing the time domain image. Above — Averaging added. 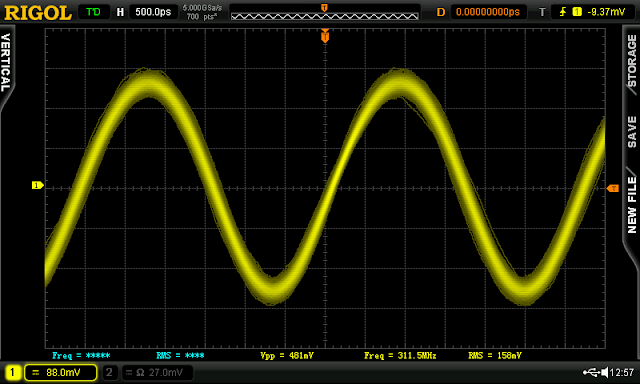 DSO's offer so much to the experimenter with digital filtering, averaging, and of course, serious math functions. 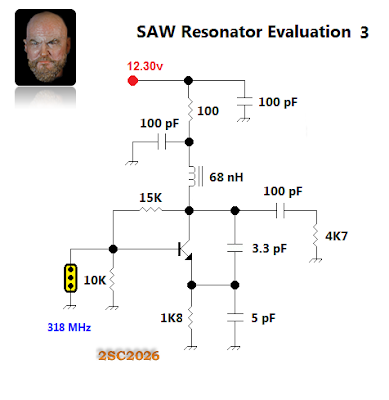 Above — FFT of the third SAW Resonator Evaluation schematic. 2nd harmonic now = -35 dBc. From this brief adventure, I will apply SAW resonators in future experiments. What about a Tx that sends a modulated WORD to trigger a super regenerative RX powering an AF oscillator to call the cats to the food bowl? Perhaps, KØDK's EMI detector? Or perhaps, we might mix the output with another oscillator to build up a UHF signal for a receiver project? Here's to you, the measuring RF experimenter! what about picture for the new bench ? Thanks to all -- you'll see some pics in future blog posts.